I’ve stated over and over about how much I love Tudor, and that I think they are a great entrance point into the higher end watch world. Tudor is owned and operated by Rolex, and benefit from that investment into watchmaking. Traditionally Tudor utilized Rolex cases but put in generic (ETA) movements to bring the cost down. There are even vintage Tudor Submariners, using the Rolex Submariner case, with an ETA (or comparable) movement inside. Tudor’s use of outsourced movement was true up until the release of the Tudor North Flag. The North Flag introduced a movement that was COSC certified, had a greater power reserved, and held the prestigious titled “in-house” to satiate the watch community. One thing that I think is worth noting in this review is that I have owned this particular watch twice. I bought a used Black Bay ETA back in December of 2016 and wore it for a couple months, including on one Caribbean trip where I took it diving. When I got home, I sold it, for reasons that escape me at this moment. My preference for this watch never really left me though, and I was looking for opportunities to get it back. I bought a Tudor Ranger (previously reviewed here) and that was great, but didn’t quite fill the niche I wanted. So on a fateful trip to my Tudor AD I found that they were clearing out some of their ETA Black Bays at a deeply discounted price. So yes, watch world, I re-bought the watch I used to own. I was able to get a bezel color I preferred, and my name on the warranty card. All that to say that I am pulling from a spectrum of experiences to write this review, both the first version I had on bracelet, and this one that I bought on leather. Rolex, by majority opinion, has the watch game down. Their bracelets are some of the nicest I’ve owned, and their cases are simple, but made to be worn. The nice thing about buying into the Tudor line is that you’re getting the benefit of that heritage and R&D that Rolex has, at a more affordable price point. The Black Bay wears like a Submariner, except perhaps simpler, if that makes sense. Sure, there are going to be some (minor) differences particularly in the bracelet, but the Black Bay wears comfortably and trim to the wrist. The ETA case has a flat caseback, whereas the in-house versions have a rounded (bubble) caseback. I don’t personally have the in-house version but I’ve heard some people say that it didn’t bother them, and others say that it did, I’ll leave it to you to make your own assessment there. So the modern black bay comes in two flavors. ETA, as pictured, and the in-house version. While there are subtle differences to the dial and case between the two versions of the watch, the real differences are mechanical. On one hand the ETA version has a dial that’s closer to vintage Tudor pieces, is more easily serviced, and is no longer being produced. The in-house version is Chronometer certified, has a longer power reserve, and satisfies those that must have in-house. Here’s what I’ll say, when it comes time for a service any competent watch maker will be able to get a 2824 up and running to spec whereas with the Tudor in-house you’ll need to send it back to Tudor. That may or may not be an issue for you. In terms of time-keeping, the ETA version keeps excellent time within COSC specifications, so I don’t see much of a debate in that regard. The black bay takes a lot of inspiration from it’s bigger Rolex brother’s when it comes to case design. In many ways Rolex has built their reputation on making simplistic diver designs, and Tudor is following along nicely. The case itself is simple, largely polished, with subtle bevels on the edges.The tops of the lugs are brushed offering a nice contrast. The crown and crown tube set the Black Bays off from other dive watches. The crown itself is 8mms, jimped, with the Tudor rose printed on the end. The crown stands off the case on a crown tube that is anodized to match the bezel. It’s a striking feature visually. The watch itself is rated to 200m, this seems shallow when you compare it to other dive watches that have a depth rating of 300 or more. What I can tell you about this is, I took my Black Bay diving in the Caribbean and it functioned perfectly fine, granted we no where near approached the max depth of this watch (who would?) but it maintained a high level of visibility, not to mention it’s implied water proof-ness throughout. So following our traditional top down approach let’s start with the crystal on the Black Bay. It’s a nicely raised sapphire crystal that terminates in a slight dome with great anti-reflection coatings making the dial easily read. I think the raised crystal here really lends itself to the vintage appeal to this classically inspired watch. The bezel is a simple diving bezel, 120-clicks around the circumference, single minute ticks during the first 15mins then just 10 minute intervals from there out. It’s a very sturdy bezel with no slop in the action, the indicators snap directly to each minute marker. It’s a very satisfying action to play with honestly. And lastly the dial. Tudor knows how to make watch dials. The red bezeled version has a gilt dial with gold accents and vintaged lume. The blue bezel seen here has silver accents and white lume. The polish on the hands and applied indices really makes this watch catch the light, and it’s easy to get stuck staring at it. The hands themselves are worth commenting on, Tudor uses a modernized snowflake hand on the Black Bay. This causes the hour hand up really jump off the dial at a glance making reading the time very easy. They can be polarizing, but I really like the hands. And the lume used on the Black Bay is excellent. Black Bays are available on a variety of strap options. Tudor really benefits from having Rolex’s experience with bracelets. The steel oyster style bracelet that comes on the Black Bay is excellent with screw together links, and a really nicely executed fold over clasp. They are extremely solid and compliment the case very well. As I stated earlier I’ve owned this watch twice. One of them on the bracelet and one of them on the leather strap. As of the writing of this article I actually have gone out and sourced the bracelet on the secondary market. They are that good. The OEM leather can be hit or miss on watches, but I find that to be less of a big deal due to the fact that it’s pretty easy to source your own leather strap later on if you want. That being stated, the dark blue leather compliments the blue bezel really nicely, and the deployant clasp is excellent. Something else that I am pretty excited about, the heritage versions of Tudor watches ship with a Tudor OEM Nato. These are my favorite NATO straps in existence. There are sewn in pockets for the spring bars, and the length of the two keepers is adjustable. The weave of the material is very tight and the straps have a feel that is unlike any other nylon strap that I have. Tudor utilizes the same company to make these straps as the Vatican uses to make their textiles. So, that’s pretty cool. A watch so nice that I bought it twice. It’s difficult for me to summarize how I feel about this watch in particular. It was a watch that I owned, sold, and regretted. That’s unusual for me, I typically have very little remorse when I buy and sell things, but I couldn’t let the Black Bay go. Tudor gets a lot of friction about how much the focus on the Black Bay line to the detriment of other models they make, but that doesn’t really matter to me. They’re great watches and they offer enough variety to fit anyone’s aesthetic. In short, if you’re into a very classic vintage styled diver, this might be the one for you. 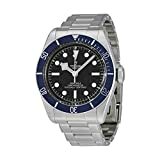 I recommend purchasing the Tudor Black Bay at Amazon or JomaShop. Please consider that purchasing anything through any of the links on this website helps support BladeReviews.com, and keeps the site going. As always, any and all support is greatly appreciated. Thank you very much. Very nice. I like Tudor a lot too. Wish they’d make an Advisor that was more like the old model (smaller and more simple), Which reminds me that “simplistic,” (used above) means overly simple. I think you meant Rolex’s designs are simple, not simplistic.